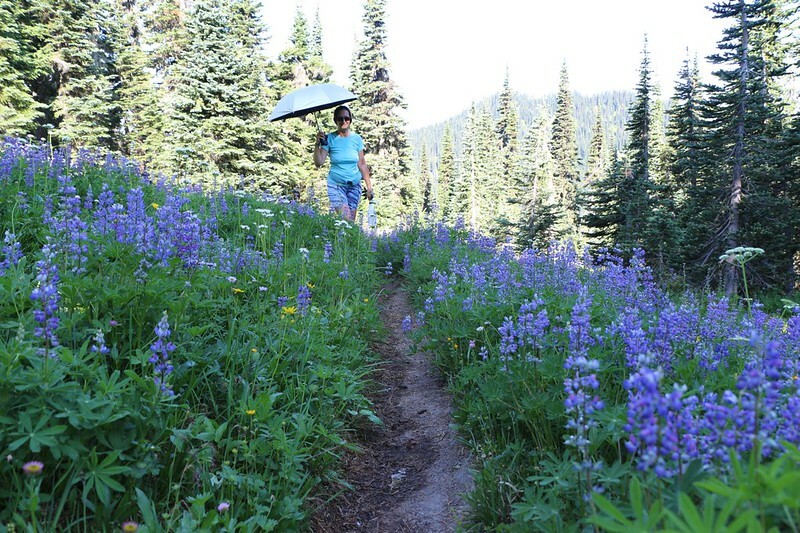 Hiking the High Pass Trail turned out to be one of the highlights of our entire trip. 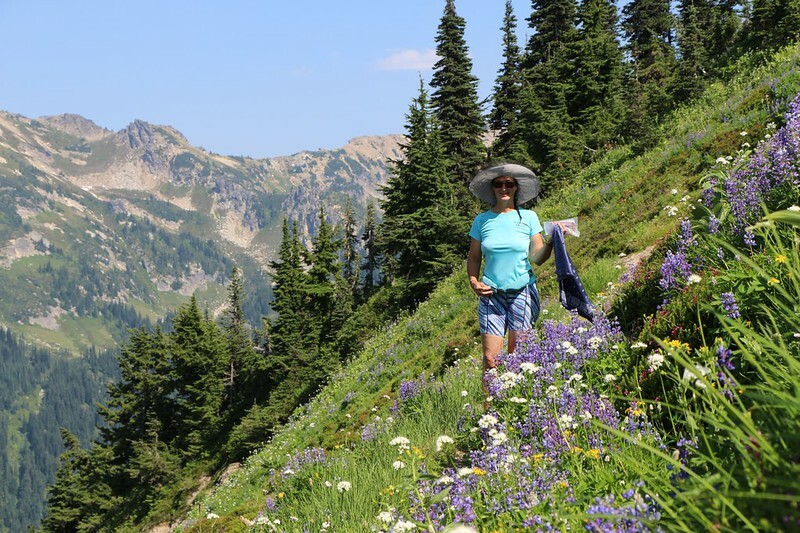 The trail climbed above the treeline, into the alpine zone at 7000 feet, and traversed along the ridge between Liberty Cap and Buck Mountain. From such a lofty perspective, the views were fantastic in all directions. 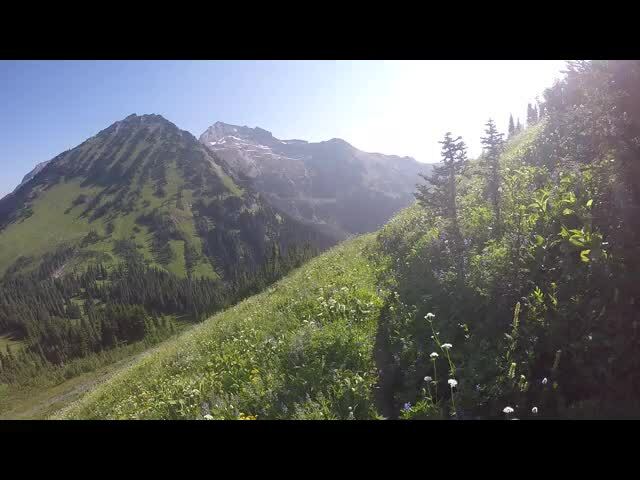 There were flower-filled meadows, a waterfall, and an alpine lake. The weather had also improved, so that the smoky haze of the past two days was almost gone. I took hundreds of photos, and had the hardest time selecting my favorites for this page. Since this was to be the first of two “layover” days on our ten day hiking trek, our plan was to sleep late and relax all day. But did we? No. 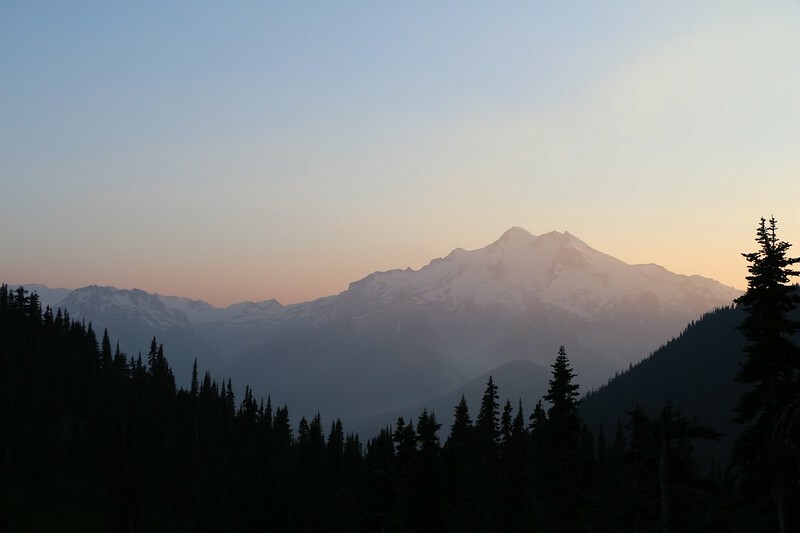 We woke at first light, got dressed, and went outside to take some photos of Glacier Peak at dawn. 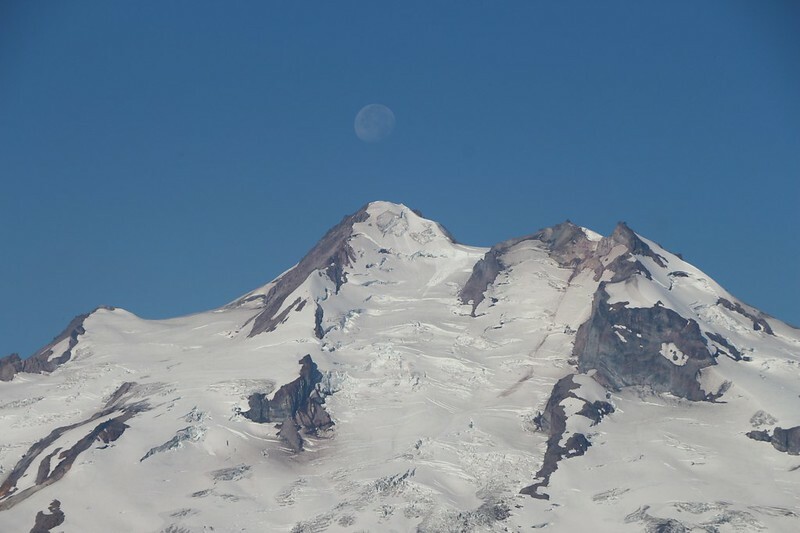 We watched as the sunlight struck the top of the peak, lighting it with a fiery glow, as if it was still an active volcano (it last erupted about 300 years ago). Afterward, we returned to the tent and got back in the sleeping bag. It was chilly out there! But our rest didn’t last very long. Soon enough, the sun rose above the mountains to the east and shone directly on the tent, making sleep impossible. It also warmed the air inside, and we were able to get dressed for the day in comfort. Vicki cooked some breakfast and we drank coffee while reading our books and watching the other campers hike on out. They had to hustle elsewhere because they didn’t have enough time to take a layover day. What a shame. Panorama of Liberty Cap and nearby peaks. 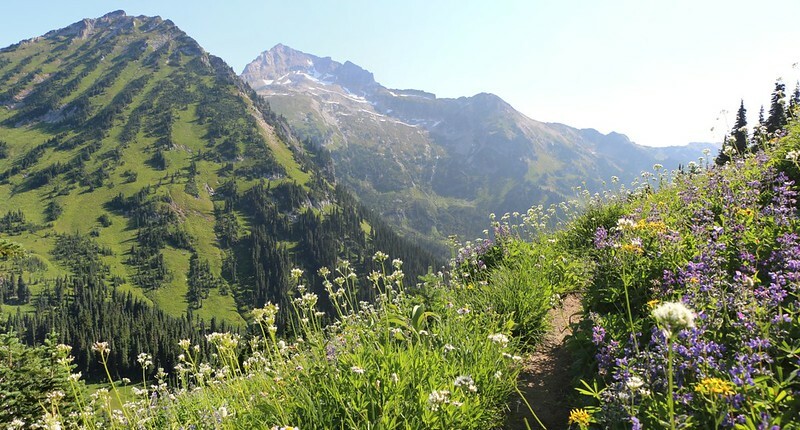 We’d be hiking up there soon enough. Then we got ready for our day-hike. We emptied Vicki’s pack and filled it with goodies: Water, food, extra clothing, and the Ten Essentials. I would be carrying the pack while Vicki carried herself. Even with all the goodies the pack was mostly empty, so it was almost unnoticeable on my back, in comparison to my big pack. We were both travelling light. We had been looking forward to hiking this trail, as every trip report I’d researched mentioned how great it was. And we were about to find out. 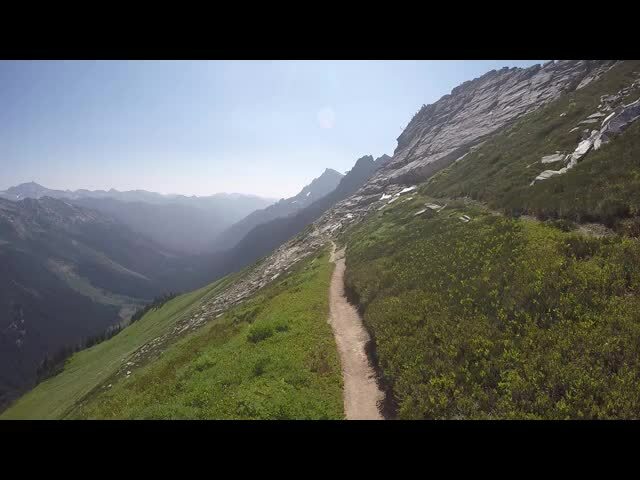 There were no trail signs for the High Pass Trail, so we weren’t entirely sure how to get started. 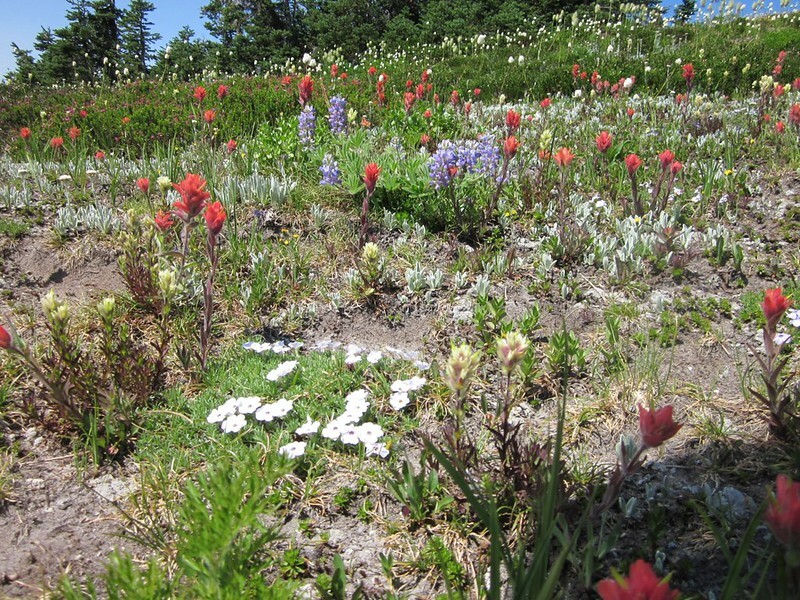 But we could see the trail way up on the side of Liberty Cap where it switchbacked across a high sloping meadow. How to get there? We headed down to Buck Creek Pass itself, down near the creek where we’d pumped water. There were a number of obvious trails in the area. We decided to take the biggest one, the one that headed directly for Liberty Cap. We were feeling pretty good until it made a U-turn to the right, heading directly back toward our camp. But it was also climbing uphill steadily, which was a good sign. 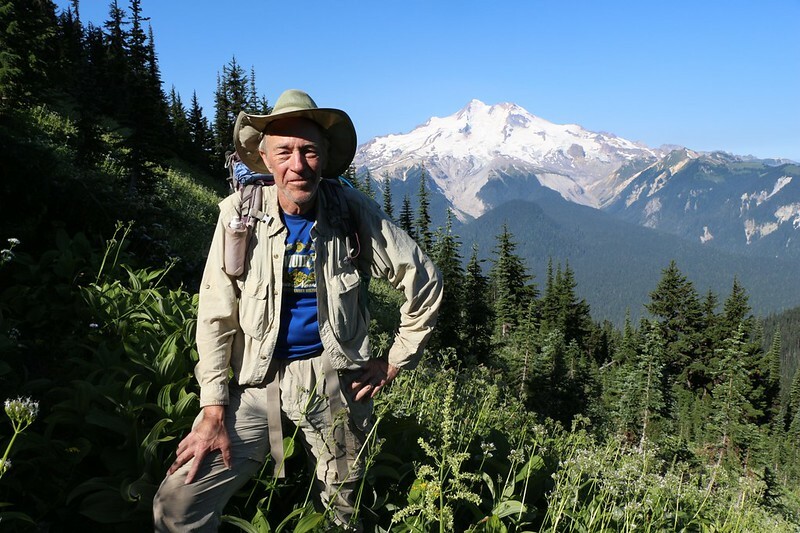 We continued onward, and were rewarded when it reached the top of a low forested ridge and made another U-turn to the left, back toward Liberty Cap. After that, there were no more choices, and we knew that we were heading the right way. 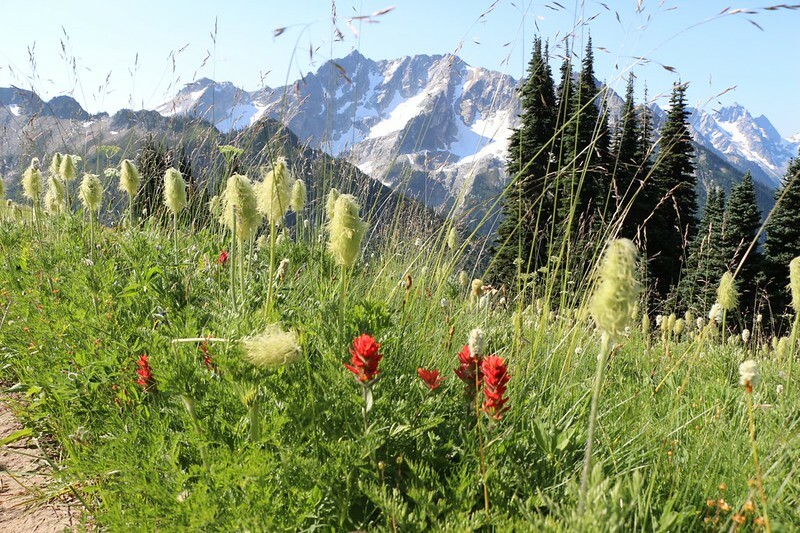 Eventually, the forested ridge gave way to meadows, and the views got better and better. 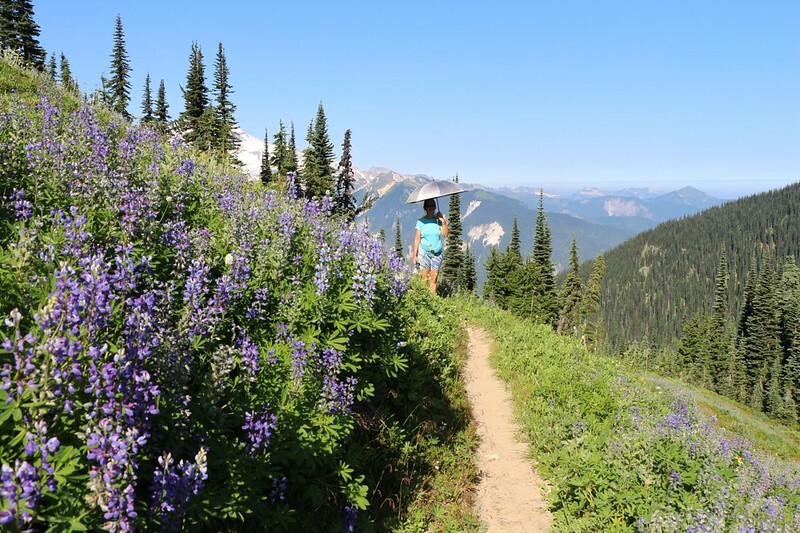 There were flowers blooming everywhere: Fuzzy-topped Western Anemone, purple Asters, bright red Indian Paintbrush, and swaths of blue Lupines wafting their candy-sweet scent in the air as we climbed ever-higher. 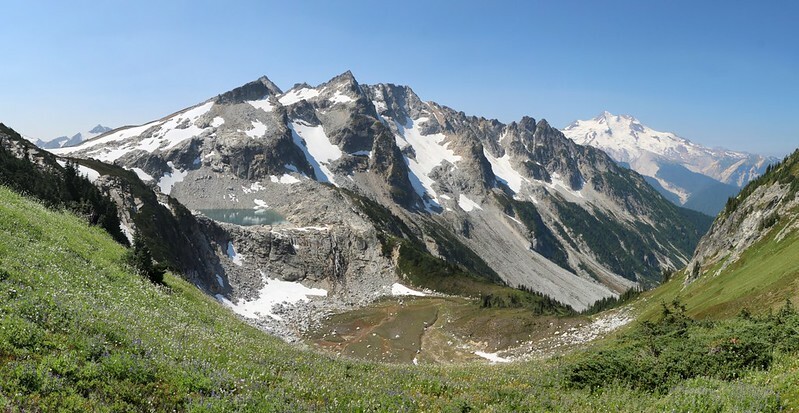 Glacier Peak towered majestically across the Suiattle River Valley to the west, while Helmet Butte and Fortress Mountain rose above us to the northeast. It was glorious. This trail was more beautiful than anything we could have imagined. After the steady initial climb up the north ridge of Liberty Cap, the trail mellowed out and traversed around to the western side of the peak. The going was easy, the flowers were blooming, and the views got better. Soon we were hiking along, high above Triad Creek. 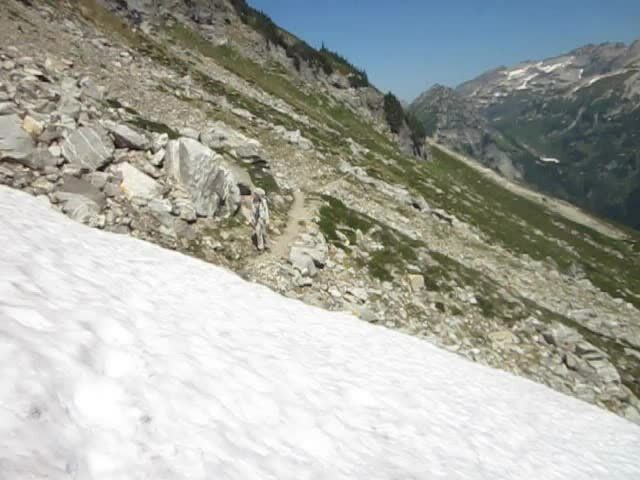 Yesterday, we’d heard from another hiker that he’d seen a pair of bear cubs down below, frolicking on a meadow and snow bank, and we were hoping for a repeat performance today. But no such luck. Vicki taking a break on a rocky outcrop, looking at Liberty Cap and Buck Creek Pass (right). Our camp is down there. The trail climbed a bit higher until it reached a saddle between Peaks 6909 and 7206 (they have no formal names, only elevations marked on the topo map), at which point we were on the east side of the ridge. We were able to look down into the Buck Creek Valley from up there. It was fun to spot parts of the Buck Creek Trail across the way, where we’d hiked the past two days. We took a break for awhile, as we remembered the sections where the trail crossed avalanche paths, and where it had climbed exceptionally steeply. We could see the burned section far down the valley where we’d camped the first night. 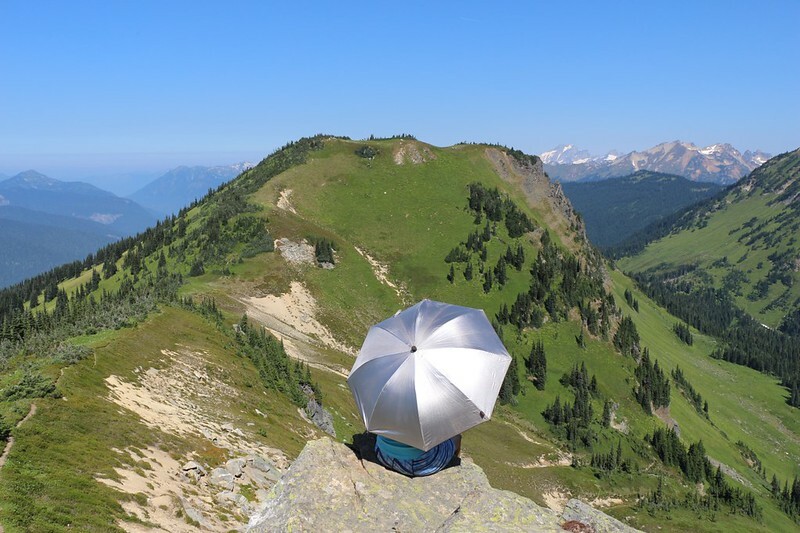 We were so glad that we were up here, relaxing in the sun, and not down there, sweating and toiling with heavy packs in the heat. And that was when we realized that the super-annoying Deer Flies were almost completely absent. Hallelujah! It was like a dream come true. Maybe it was the breeze, or the lack of trees. We’ll never know for sure. But we enjoyed it just the same. And the trail was easier, too. 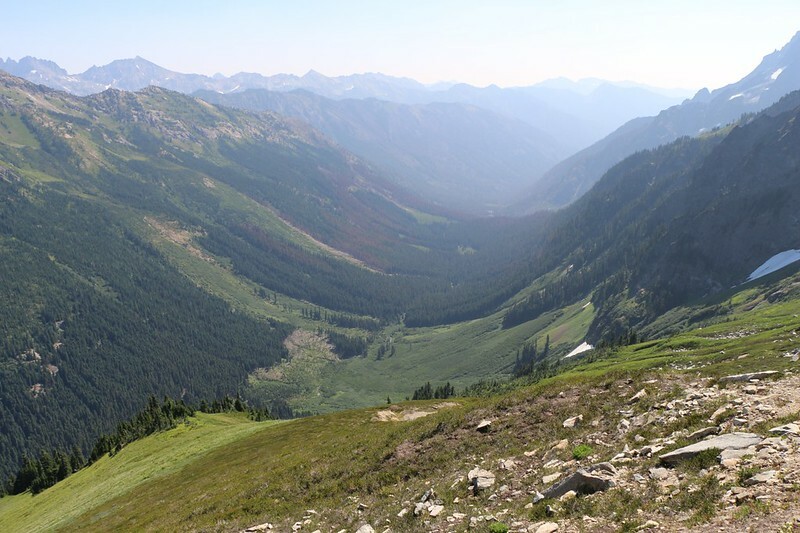 It side-hilled along, traversing well below the ridgeline, an easy, airy hike. The only tricky part was when we came upon the remains of what was once a mighty snow drift. 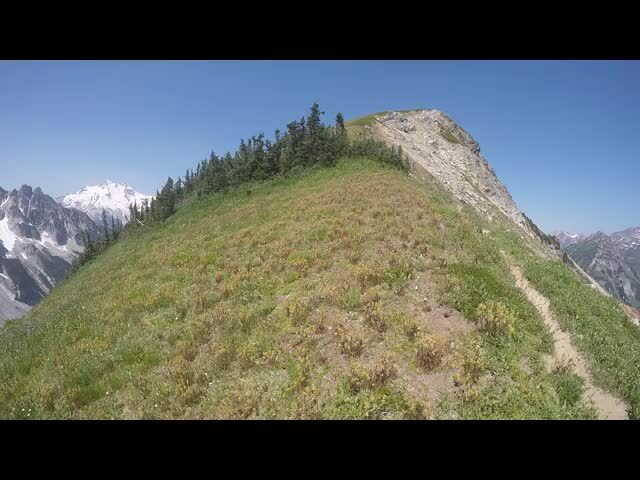 The trail crossed it, and the slope was relatively steep. It would be easy to slip on the icy melting snow if we weren’t careful. 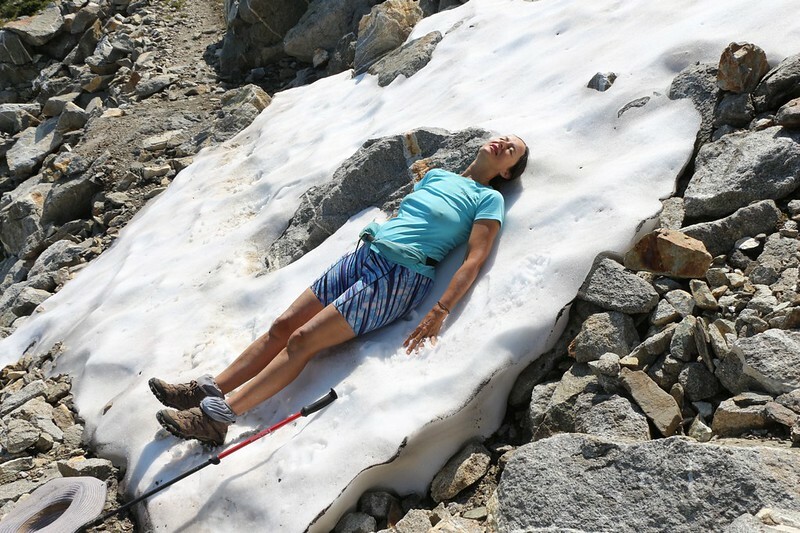 I regretted leaving our microspikes back in camp, but I wasn’t expecting any snow near here (I brought them for a glacier crossing we’d have to do on day nine). Of course, we could have picked our way on rocky terrain either over or under this snowbank, but where was the challenge in that? 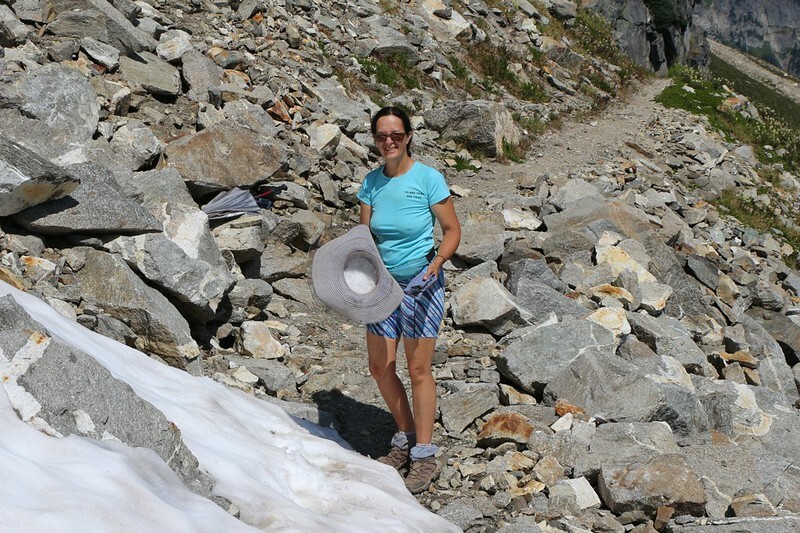 Vicki grabbed some snow to put inside her hat for cooling purposes, then made her way across. She had her hiking stick for support and kicked some steps in the snow as she went. Unfortunately, I also left my hiking stick back in camp, so was forced to make my way across the old fashioned way: Slowly and fearfully. The Buck Creek valley from above on the High Pass Trail. We spent two days hiking up that valley. We reached a high saddle and took in the views to the west. It was truly an awesome sight: Snowy mountains and an alpine lake, complete with waterfall! We immediately decided that this was the perfect place for lunch. We sat down in the midst of wildflowers and took off our shoes in order to enjoy them even more, letting our toes feel the cool leaves of the plants. We ate lunch and took a short nap in the sun. We got out the map and realized that High Pass itself was actually across the way, above the lake. It looked like the trail to get there climbed directly on the high ridge, and that you’d have to summit Mount Cleator (Peak 7526) along the way. We decided that the view from right here was plenty good enough for us, and that whatever was beyond High Pass would have to remain a mystery. 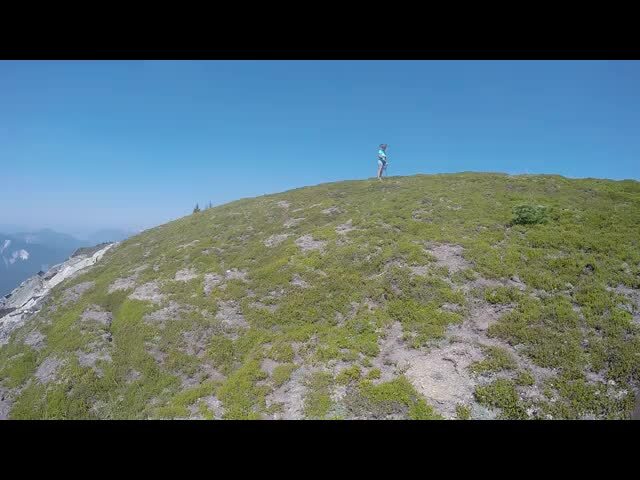 After we packed up and put our shoes back on, Vicki decided that she wanted to hike a tiny bit further. She was hoping for a better view down the Triad Creek Valley. I was feeling a bit lazy and didn’t want to head up there, for what looked to be a minimally rewarding view. I tried to dissuade her, but to no avail. And that’s when I decided to follow her, instead. She has an annoying track record of doing crazy things that work out really well, and I knew I’d be sad if I stayed behind on the saddle. Luckily for me, there was a lot of steep uphill hiking involved, and she gave up relatively quickly (I was worried she might want to climb Mount Cleator). But, as usual, the views we got were worth it. Thanks, Vicki! After that, it was time to return to camp, so we headed back the way we came. 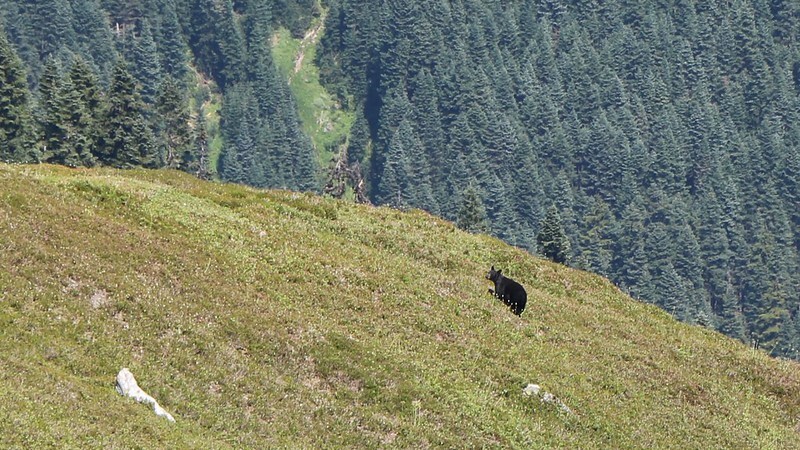 Along the way we saw a black bear walking along the sloping hillside far below us. It looked like he was also enjoying a fine Summer’s afternoon, munching on berries, taking his time. I was zooming in with my camera as best as I could, and then I realized that he’d spotted us. He immediately began making his way steadily on a long uphill diagonal toward the next saddle, the one that we were also heading for. He was fast! In no time at all he’d covered a whole lot of ground and was gone, disappearing over the ridge. We’d barely hiked a quarter of the distance by then. It was impressive. When we got to the saddle we stopped and looked for the bear on the other side, but he was long gone. 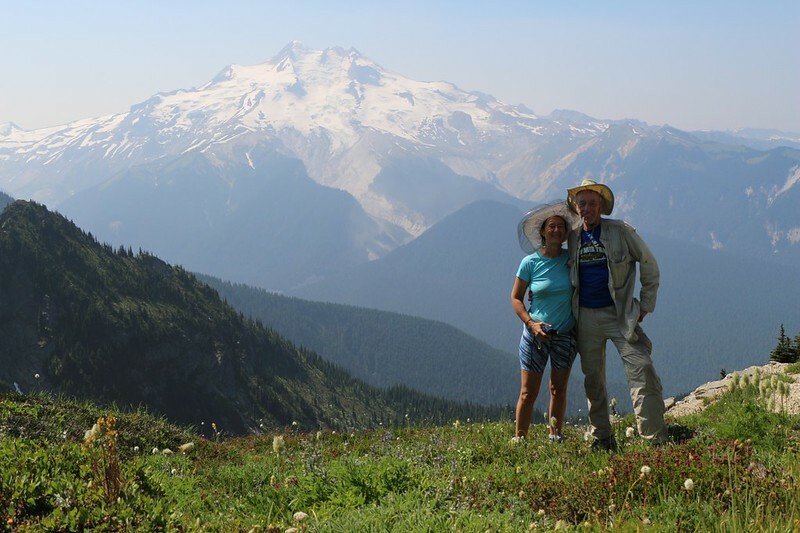 The view from here of Glacier Peak was stunning, so we stopped and set up the camera on timer mode, to get a rare shot of both of us. This looked like one of those spots where a posed photo is truly warranted. If it looked good enough then we might even print it and hang it up on the wall at home. We try to take at least one photo like this on every trip, if possible, with varying results. This one turned out OK.
Vicki cools off by resting directly on the snow – hot babes on ice! An hour or so later we were back in camp, after some easy downhill hiking. We though about taking a nap, but remembered that we really needed to get some laundry done. When you only have two outfits (daytime and nighttime) the one you sweat in every day gets a bit ripe. We also needed more water for dinner and breakfast tomorrow. So we put on our less-stinky clothing and headed down to the stream. It was time to get our chores done. And there weren’t any washing machines out here in the wilderness. 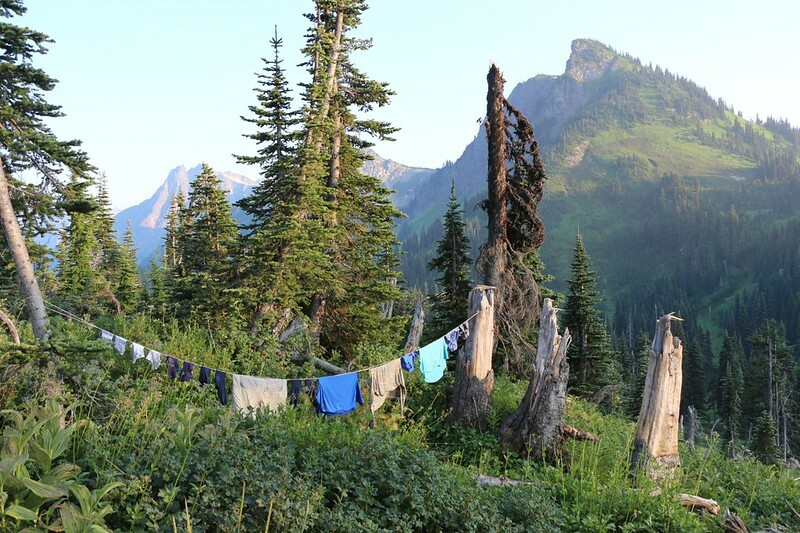 We had to haul our water away from the stream into one of the nearby campsites, at which point Vicki used our biodegradable soap to wash each piece of clothing the old fashioned way: with elbow grease. She did the soaping and I did the wringing. Then we got more water and rinsed each piece, soaking and wringing, and rinsed them yet another time. Then I did the final mighty wring, and we put them in a plastic bag. We filtered two gallons of water, then I carried it all back up the hill to camp. We suspended a makeshift clothesline between two trees and hung everything out to dry in the sun and breeze. Ah! It was satisfying to get some chores done. And then it was time for a nap. 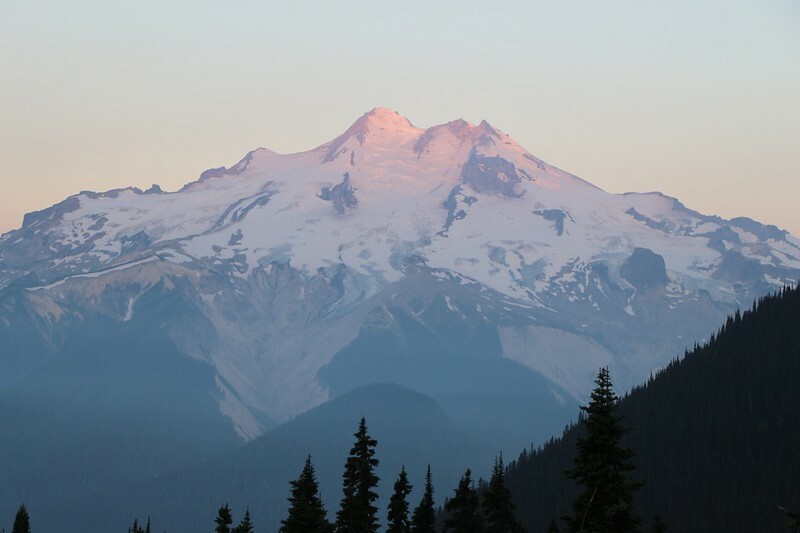 Afterward, we put on some warmer layers and ate our dinner as the sun descended behind Glacier Peak. We got out the map and amended our hiking plan for the next few days. We decided to hike a bit extra tomorrow, in order to make the next big climb to Image Lake a lot easier. We’d forgo a great view from camp tomorrow night, but it would give us extra time to enjoy the beauty of the lake the following day, so it would be worth the trade-off. 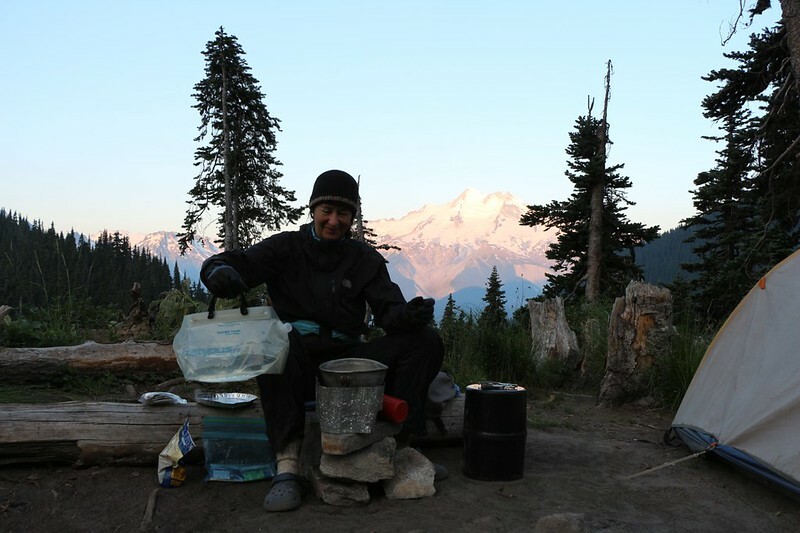 Since tomorrow’s hike would begin by descending, we decided that there was no point in getting up before dawn. We’d simply wake up and get going when it got light outside. We were in no hurry, after all. We were on vacation!